The Western Himalaya, stretching from the northeastern tip of Afghanistan to the confines of Nepal, is home to more than tall mountain peaks. Along its foothills are tropical forests that harbour an incredible diversity of plant and animal species, among which are the sacred peepal fig tree, the Great hornbill feeding on its fruits, or the iconic Bengal tiger. With such abundant wildlife, it is no surprise that the region attracts a large number of tourists; however this development also takes a toll on the local animal populations. The volume of dumped garbage is increasing alarmingly in and around natural reserves; the lack of trained guides and knowledge of bird distributions limits tourism to a few well-known and overexploited spots; and human encroachment combined with climate change result in a loss of habitat whose impact on wildlife is difficult to measure without precise ecological data. The non-profit trust Nature Science Initiative was created by local conservationists with the mission of applying science to address conservation issues in the Western Himalayas. NSI aims to do positive ecology: move beyond identifying problems, and into finding solutions. Through their targeted actions such as public engagements, training of wildlife guides from local villages, or conservation outreach in schools, they are working to address biodiversity issues identified from scientific research, using socially equitable approaches to create sustainable positive impact. The volume of dumped unsegregated garbage, in which bio-degradable elements are mixed with toxic wastes, is increasingly alarmingly in India. Plastic ingestion has a documented and severe effect on mortality in domestic animals feeding on garbage dumps, and is thought to pose a serious health threat to wild animals, including already endangered species. In rural areas, plastic ingestion also kills hundreds of thousands of cows every year, a huge toll taken on the income of farmers. Indian plastic frenzy has dramatic consequences on public health, as toxic substances contained in plastic leak into soil and water before coming back up the food chain. Slow Motion Projects supports NSI in encouraging the use of simple individual actions for garbage disposal and segregation, towards a cleaner and safer environment for animals and people. 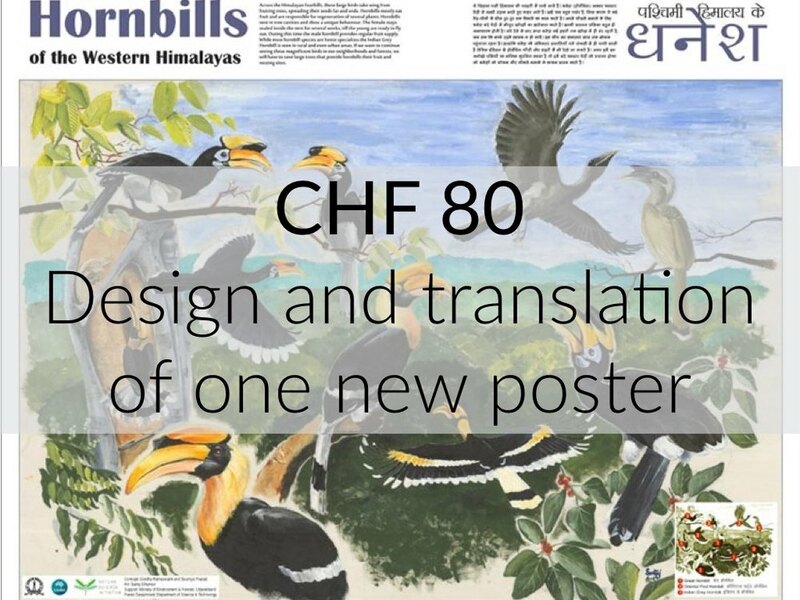 Support applied research on the precise effects of open garbage dumps on the endangered animal species of the Western Himalaya. Outdoor nature education is rarely part of the Indian school curriculum. Children across schools in India are more likely to have heard about the penguin, which does not occur in India, than the common hornbill. Nature Science Initiative is committed to connect the future generations with their environment through fun and interactive experiences. Slow Motion Projects supported NSI in printing and distributing a new children's nature education book, "The Secret Garden". We gave the book to children in schools, to make them think of the ancient relationship between the sacred peepal tree and its partners, the wasp and the hornbill. With a structured nature education program, we supported NSI in getting the children to make observations of local trees and birds, so they begin to interpret by themselves how ecological relationships sustain life. Supported the educative team in carrying out nature education in Uttarakhand, so they can talk to kids about what they can do to address conservation.